Have diners running home with this Farmhouse Chicken Dinner. 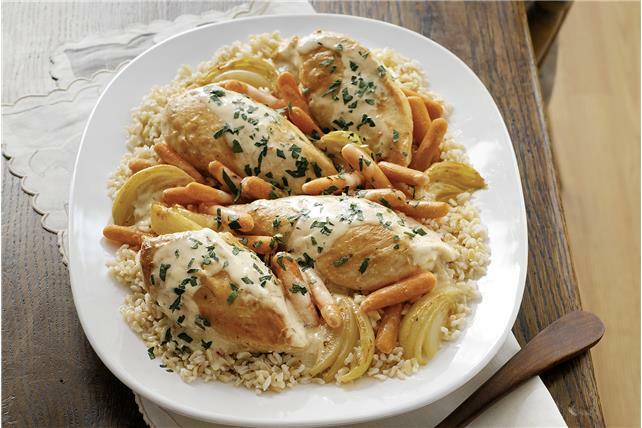 Our Farmhouse Chicken Dinner features veggies and a flavorful, creamy pan sauce. Mix flour and pepper in shallow dish. Add chicken; turn to coat both sides of each piece. Gently shake off excess flour. Heat dressing in large nonstick skillet on medium heat. Add chicken, meat-sides down; cook 5 to 6 min. or until golden brown. Turn chicken. Add carrots, onions and 1 cup broth; cover. Simmer on medium-low heat 20 min. or until chicken is done (165°F). Meanwhile, cook rice as directed on package. Spoon rice onto platter. Use slotted spoon to remove chicken and vegetables from skillet; place over rice. Cover to keep warm. Add Neufchatel and remaining broth to liquid remaining in skillet; cook on medium-high heat 5 min. or until Neufchatel is melted and sauce is well blended, stirring constantly. Simmer on medium-low heat 3 to 5 min. or until slightly thickened, stirring occasionally. Spoon over chicken and vegetables; top with parsley. Substitute 8 bone-in chicken thighs with skin removed for the chicken breasts.